The Lorex 4K Ultra HD IP NVR System with 4 Outdoor 4K 8MP IP Cameras is a Lorex security camera best suited for residential homes. Features include 4K capable Network Video Recorder (NVR), long-range color night vision, and listen-in audio. 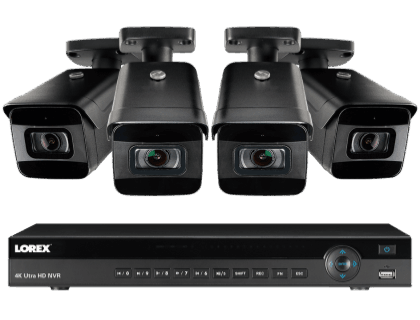 4 × 4K bullet IP cameras. 275ft maximum night vision range. Pros: Great camera quality with easy to use software. Cons: Can be a bit expensive for a small business. Bottomline: Solid option! Has great image quality and it's easy to set up. However, some features need improvement. What are some alternatives to the Lorex 4K Ultra HD IP NVR System with 4 Outdoor 4K 8MP IP Cameras? Where can I buy the Lorex 4K Ultra HD IP NVR System with 4 Outdoor 4K 8MP IP Cameras? The Lorex 4K Ultra HD IP NVR System is available on Amazon and the Lorex website. Does the Lorex 4K Ultra HD IP NVR System with 4 Outdoor 4K 8MP IP Cameras work at night? Yes, the Lorex 4K Ultra HD IP NVR security camera system offers nocturnal features. It offers up to 275 ft. of infrared night vision and up to 225 ft. color night vision. Can the Lorex 4K Ultra HD IP NVR System with 4 Outdoor 4K 8MP IP Cameras be used in any weather? Yes, the camera system has been designed to withstand a range of weather conditions including heavy rain, snowstorms, or scorching summer heat.